Decommissioning Support Services - P.W. Grosser Consulting, Inc.
PWGC offers comprehensive decontamination and decommissioning (D&D) and waste management (WM) services for facilities that have reached the end of their useful life, as well as cost estimates for specific end states for your site. Our team of experts have extensive experience in decommissioning various kinds of reactors. 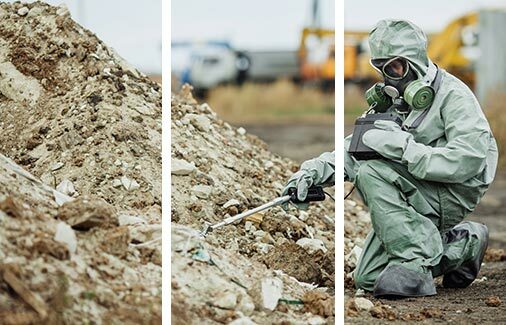 For projects requiring treatment and handling of radioactive waste or spent fuel, including storage and disposal, PWGC is ready to provide a suite of comprehensive, state-of-the-art solutions. PWGC counts the Department of Energy’s Brookhaven National Laboratory (BNL), the United States Environmental Protection Agency and the General Services Administration among the federal clientele who have benefited from our in-depth experience. The following project summaries have been selected to demonstrate our spectrum of experience. Detailed project descriptions can be provided upon request. The Waste Transfer Lines Project was part of a suite of near-term decontamination and dismantlement (D&D) remedial actions for Brookhaven National Lab’s HFBR. The transfer lines consisted of the A-, B- and original D-waste lines; the non-acid off-gas pipe; the steam line; and the replacement stand-alone D-waste line. PWGC conducted a Preliminary Assessment/Site Inspection (PA/SI) within the reactor and BOP structures at Brookhaven National Lab (BNL) to determine the existence of potential pathways for contamination to reach the environment, and whether identified issues warranted designation as an Area of Concern (AOC). PWGC researched, collected, and reviewed historical, public, and environmental records, building construction drawings, and available site-specific data, and conducted informal interviews with HFBR personnel. Potential issues, considered areas of interest (AOIs), were numerated and PA results documented to develop an investigative scope of work for the SI. PWGC prepared the project documents to conduct the investigation such as: Sampling & Analysis Plan, Health & Safety Plan, and Waste Management Plan. In the PA, PWGC identified a total of 53 AOIs. This being a comprehensive review of available environmental reports and on-going investigations, 26 AOIs were eliminated from the scope since they were being investigated as part of other projects, leaving 27 AOIs for further investigation for which PWGC conducted radiological walk over surveys, surface/subsurface soil sampling, and groundwater sampling. Based on the SI data collected, PWGC integrated the results into the PA/SI Report; eliminating an additional 23 AOIs, and entered the remaining 4 into a tracking system pending future evaluation, since they could not be addressed due to their location. One AOI for the site was soil quality surrounding the spent fuel pool, suspected as a source of tritium groundwater contamination. This required coring through a 5-foot thick, reinforced heavy concrete mat with embedded contaminated piping systems. PWGC implemented a specialized geophysical survey to locate rebar and piping systems. Six coring locations were chosen. Coring through the mat was conducted without an occurrence and soil and groundwater samples were collected. There was no significant source of groundwater contamination present under the building. Collectively PA/SI results were used to support decisions for end state alternatives for the HBFR and BOP structures. Brookhaven National Lab’s HFBR Stabilization Project included preparing the HFBR confinement building (Building 750) for long-term safe storage and removing localized radiological contamination in areas immediately outside of Building 750. This project was performed in part with funding from the American Recovery and Reinvestment Act (ARRA) and in accordance with Closeout Procedures at National Priority List Sites, OSWER Directive 9320.2-09A-P.
PWGC performed a detailed analysis of the project scope, schedule, and costs related to the cleanup of radiologically contaminated facilities and soils along the Columbia River at the US Department of Energy owned Hanford Reservation. PWGC engineers focused their efforts on validation of cost estimates for the D&D of contaminated facilities and site restoration and made improvements to the project schedule. PWGC prepared project plans, cost estimates, and schedules related to the cleanup of radiologically contaminated buildings and soils at SPRU at the KAPL, located in Niskayuna, New York. The project plans, cost estimates, and schedules were required to provide the US Department of Energy with the necessary information to approve Critical Decision 1 (CD-1) for the remediation and D&D of contaminated structures. PWGC was part of an independent project review (IPR) team responsible for evaluating the CD-0 (mission need) planning of a D&D project to remove an unused research building at LLNL. PWGC’s areas of responsibility primarily included the technical scope and the value engineering aspects of the review. Project documents were obtained and reviewed and key project personnel were interviewed. PWGC then participated in preparing a report presenting the findings of the review that included positive achievements, suggestions for improvement, recommendations and stated that the project was justifiable and the mission need was sound.